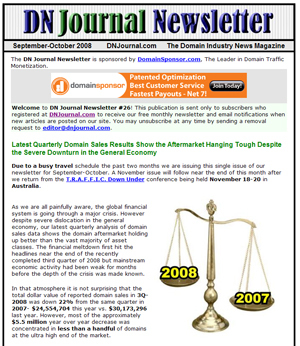 latest quarterly analysis of domain sales data to see how the the domain aftermarket is holding up in the face of the financial meltdown in the general economy. We compare the recently completed third quarter of this year vs. the same quarter of last year as well as Year to Date results for 2008 (Quarters 1-3) vs. the same time frame in 2007. The results may surprise you! The newsletter also features more details (and new photos) from domain industry giants Dr. Chris Hartnett and Dr. Kevin Ham recounting their experiences at the Harvard Business School where they just completed the rigorous and internationally acclaimed Harvard Advanced Management Program. At the end of the session, you’ll have the opportunity to have your specific questions answered. This event is free, but pre-registration is required. You can sign up here. Sedo has also announced a special event for later this month. Starting at 1pm (EST) on November 27th, they will will host a numeric-themed domain auction featuring some of the most popular and universal numbers. These include two-digit domains like 88.com, 40.com, 13.net, 70.com and less generic domains such as the prestigious Manhattan zip code, 10029.com. The one-week auction will end on December 4th at approximately 1pm EST. 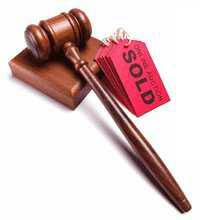 Sedo is also accepting domains for this auction event. For more information on seller criteria, owners of generic numeric domains can contact Sedo Broker Matthew Rosebrook at Matt.Rosebrook@sedo.com or call (617) 499-7238. Qualifying sellers can also apply directly through their Sedo account.